The Dutch modelling insurgence continues with the arrival of Westervoort native Lieke Van Houten on the international modelling stage. Discovered via the Elite Model Look competition in 2011, Van Houten took out the Dutch title before placing amongst the top 15 finalists at the international finals in Shanghai. Signed by mother agency Micha Models in Holland, Van Houten has wasted little time in making an indelible impact locally with editorial appearances for the Dutch editions of Vogue, Elle, and Glamour. 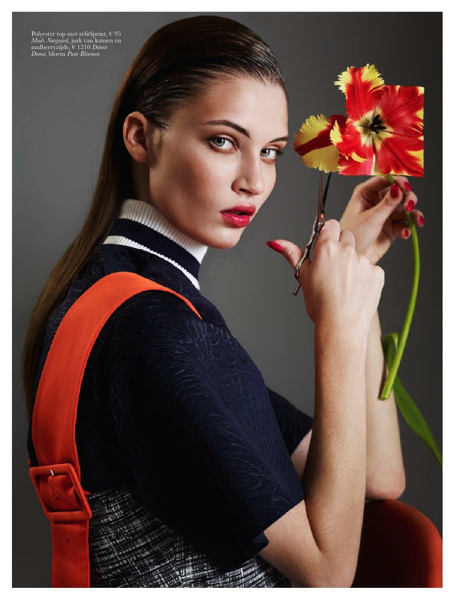 Modelling full-time since completing her higher school education, Van Houten debuted on the international market via a pivotal key spot in Prada's Spring/Summer 2014 campaign lensed by Steven Meisel. Amidst an impressive cast of established and new faces, Van Houten's intense gaze and powerful presence ensured she stood out from the model pack. 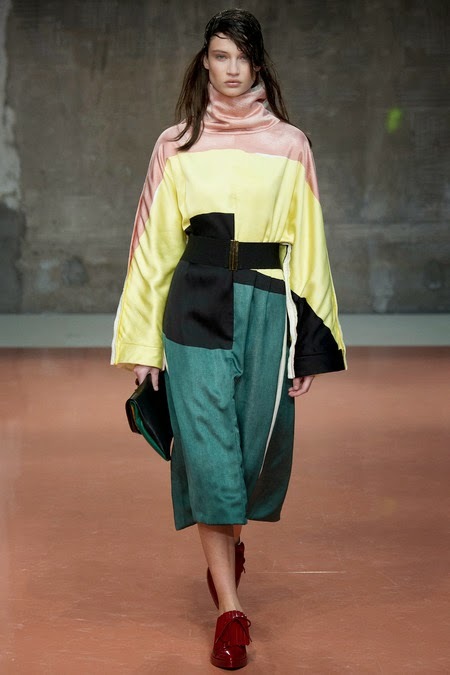 Buoyed by that momentous Prada campaign berth, Van Houten's continued to galvanise industry attention at the Fall/Winter 2014 collections in Milan and Paris, walking for Dsquared2, Marni, Dolce & Gabbana, Jacquemus, and Chloé. Van Houten's rich chestnut brown hair, peaches and cream complexion, and sparkling blue eyes turned heads recently during her first working stint in New York this past Spring. Editorial bookings for Contributor and the Last Magazine, and test shoots with Mark Luckasavage, Billy Rood, and Scott MacDonough hint at Van Houten's promising future. When IMA met Van Houten in New York at the castings for Chloé Resort held by Elodie Yelmani Casting, the seventeen year old was a beguiling concoction of girlish charm mixed with a sophistication beyond her years. Van Houten's slender 177 cm frame, Lolitaesque pout, and feline-like eyes cut a fine figure as she glided across the room while demonstrating her runway swagger. IMA got up-close-and-personal with Van Houten following the castings to chat about her stellar debut at the Fall/Winter 2014 collections, shooting with Steven Meisel for Prada, and her love of family and her model mom. Inoubliable Model Army (IMA): Hi Lieke, thank you for chatting with IMA! You were one of the newcomers that IMA had its eye on throughout the Fall/Winter 2014 season. What were your expectations heading into your international runway debut and how did it feel to be amongst all the action in Milan and Paris? Lieke Van Houten (LVH): I had none, I was hoping for some good shows because I was starting with a Prada campaign in my pocket. Still I didn't want to have expectations because I didn't want to be disappointed later. I'm thankful for everything I did this season. IMA: You've experienced a meteoric rise in the relatively short time you've been modelling! Would you mind sharing your backstory with IMA? LVH: Well, a friend of mine signed me up for the Elite Model Look 2011. Against my expectations, I won and went to China for the International Finals. I got into the Top 15 which was my goal so I returned to the Netherlands with a good feeling of achievement. Elite Worldwide signed me shortly after and I started with small jobs in the Netherlands and some visits to Paris. I finished my school a year ago and am now modelling full-time which I am loving. IMA: Whereabouts in Holland do you hail from, tell us about your childhood, and did you have an interest in modelling growing up? LVH: I live in Westervoort which is close to Germany and near by a bigger city called Arnhem. It's not big but it's fine. I like it up there, everybody I love is close to me. My parents are both Dutch so I'm 100% Dutch and as they say in the Netherlands, '100% kaaskop' haha! I'm 17 years old now. Modelling was never a dream if mine, it came to me when my friend signed me up for EML and that's how I came into the business. IMA: IMA has kept you on its radar since you placed in the Top 15 at the EML 2011 and was blown away when you surfaced in Prada's Spring/Summer 2014 campaign. How did the Prada booking come about and were you initially petrified at the thought of shooting with Steven Meisel on your first major modelling gig? LVH: I decided to visit my agency in Amsterdam, Micha Models, and during the first few days Micha was sending my pictures around to clients. Ashley Brokaw was excited from the beginning and booked me for the Prada campaign. So after only a week with Micha, I had my first big job. I was really thankful to work with Steven Meisel but I'll admit I was a little bit shell-shocked as this was one of my first major jobs. 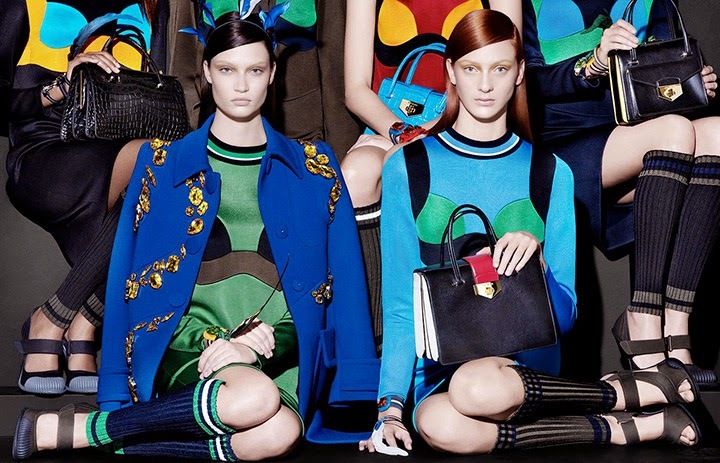 IMA: The Prada S/S 2014 campaign featured an extensive cast of newcomers. Did you get the opportunity to bond with the other models on set? LVH: Yes, I got to know a lot of the girls, some are big and some like myself were new. During Fashion Week I saw a lot of the Prada girls so it's funny how everybody gets to the same place as you. IMA: Your Fall/Winter 2014 show list included some major moments including turns on the runway at Chloé, Marni, Dolce & Gabbana, Dsquared2, and Jacquemus. Were there any Fall/Winter 2014 memories that you will cherish forever? IMA: The Dutch modelling insurgence continues with yourself, Maartje Verhoef, Julie Hoomans, Julia Bergshoeff, Annemijn Dijs, Irene Hiemstra, and Imaan Hammam emerging as the next generation of modelling superstars. What do you feel is special or unique about Dutch girls which is contributing to the industry's on-going fascination with all things Dutch? LVH: Dutchies are really laid-back and polite. I think that's why people like us so much, we're most of the time really nice and not that shy, but polite at the same time. So you'll always have fun with a Dutchie on your set! IMA: This year alone you have appeared in editorials for Contributor, the Last Magazine and the Dutch editions of Vogue, Elle, and Glamour. What do you enjoy most about the print component of modelling? LVH: I like to shoot editorials, they're always different. None is the same and it's really artistic.When you do a commercial job it's most of the time the same team, same story, same drill, it's also enjoyable but the fun part about doing an editorial is that it's never the same. It's sometimes extremely outside of the box and that also makes it so much fun to be a part of the creative process. IMA: Let's talk about the importance of sound management. You are represented by a formidable team of agents including your mother agency Micha Models, Elite Paris, and the Society NY. What do you value most about your professional and personal relationship with your mother agent Micha Emmering Krijger and the team at Micha Models? LVH: What I love most about Micha is that she's a mommy. She's really a model mom. All you have to do is call her and she'll do everything for you, when you have a problem, when you're sad, when you're doing something big, she's always there. When I'm in a city she loves to come over and visit her girls just to check if they're happy. For me Micha is the best model mom you can have! IMA: You recently embarked on your first work trip to New York where you will be based for a while. Are you excited about the prospect of living in New York and what do you hope to achieve while there? LVH: I hope to do a lot of editorials and fun jobs, to meet wonderful people and to hang out and get to know more models. IMA: What inspires you in life and what have been the most valuable lessons that you have gained as a result of your modelling experiences? LVH: That family is the most valuable thing in the world. They're always there, always proud and supportive. So when I'm sad they're there and when I'm happy likewise. I've learnt how important family is and how much I need them in my 'happy life'. IMA: Models nowadays rely heavily on social media to raise their public profile and fan base. Are you active on Facebook, Twitter, and Instagram etc, and do you feel empowered by the fact that models are encouraged to take a more active role in charting the course of their careers? LVH: Yes I am on social media, and I can feel how much people are following you once you get to do bigger jobs. After Prada, I had so many more followers on Instagram and had girls telling me they're looking up to me. But for me it's still weird to read that. I feel like any other normal human being and not like a 'big model'. I know a lot of casting directors and clients keep an eye on social media so for sure it can do something for your career! IMA: IMA absolutely adored the pink and cream coat that you wore at Chloé. Were there any outfits that you wore this season that you would love to add to your wardrobe and how would you describe your street style? 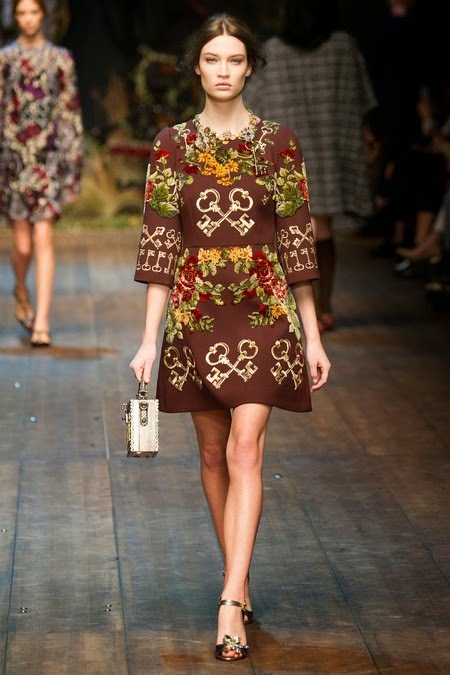 LVH: Yes, my Chloé coat and my Dolce & Gabbana dress, just because it's so Dolce and that's what I like about it. I felt like a princess for a minute. LVH: Just the person that I am, laid-back and true to myself.